Acer and Victorinox are partnering on the Cybertool watch accessory, which transforms the I.N.O.X series of wristwatches into smart ones. The Cybertool is a clip-on accessory, which allows you to see the original watch face, but has additional features. See the rest of the technical details below. The Cybertool is comprised of front and rear segments, which wrap around the I.N.O.X watch case. At the front, the curved LED screen displays various information and on its right, there are indicators to show call, message and calendar notifications. There's no getting away from the fact that the Cybertool adds a lot of bulk. However, it's IPX7 water resistant and quite durable thanks to the Gorilla Glass 3 glass on top. At the bottom, there are two buttons, which add extra functionality. The most interesting of them is the Help function, which activates by pressing the two buttons together. It then sends your GPS coordinates to a predefined contact in case of emergency. The battery is 60mAh and is rated to last a week on a single charge. Here's our quick hands-on video of the Cybertool placed on top of a Victorinox Swiss Army watch. The Cybertool is a bit pricey for our taste. 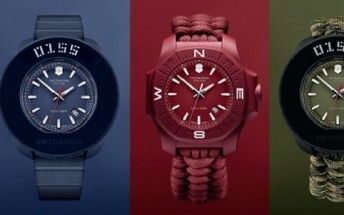 It will cost $225 and you'll ned an I.N.O.X watch, which starts at $600. The concept is neat, but it will need a wider compatibility and a lower price tag if Acer wants this to be anything more than a boutique accessory.